The feeling of something moving in knee. Knee locking as though something is blocking it. 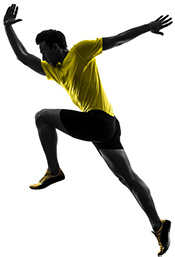 Injury to cartilage during trauma or sports can lead to the formation of a loose body. Osteoarthritis or Charcot's disease, but the secondary cause is direct or indirect trauma. Fibrinous loose bodies in case of inflammatory conditions of the knee. Synovial chondromatosis (also called synovial osteochondromatosis) is rare; synovium grows abnormally and produces nodules made of cartilage. X-ray: A loose body is typically diagnosed with an x-ray. In most cases, the traumatic loose body has a bone chip with it or a big chunk of cartilage easily seen on an x-ray. MRI: The best way to see the location and character of a loose body is with an MRI. When the loose body is just cartilage or in the case of synovial chondromatosis, an MRI is the best non-radiation diagnostic tool to assess the whole knee joint. It is a useful preoperative tool to see the size, number, and location of the loose bodies. CT scan: This is rarely used but can give details about the loose body when fracture or bone fragments are expected. There are limited options of non-surgical management of a loose body as it mainly leads to mechanical symptoms which are relieved only after removal. However, physical therapy and anti-inflammatory drugs can be used to help with the symptoms and to keep the joint flexible. Arthroscopy: The gold standard today is to remove possibly all loose bodies by arthroscopy, popularly known as “clean out “arthroscopies. It is minimally invasive and allows the surgeon to thoroughly examine the knee for a loose body and to assess any damage to cartilage and treat the condition, hence it is best the best diagnostic and therapeutic modality available. Open arthrotomy: This is less common due to the availability of arthroscopy but it can be done when the loose bodies are very large and numerous or there is associated complete synovial involvement.